Titled “To The Struggle Against Word Terrorism”, this 100 foot tall artwork stands at the end of the former military pier in Bayonne NJ. 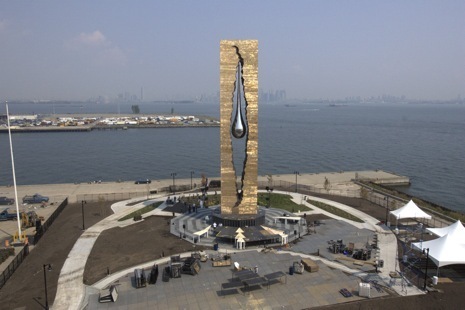 Also known as the “Teardrop Memorial” the heavily symbolic work is situated so that it is exactly in the middle of the sight line between the Statue of Liberty and the World Trade Center to the north. The eleven sided pedestal that supports the statue is inscribed with the names of the nearly 3000 people who lost their lives that day. 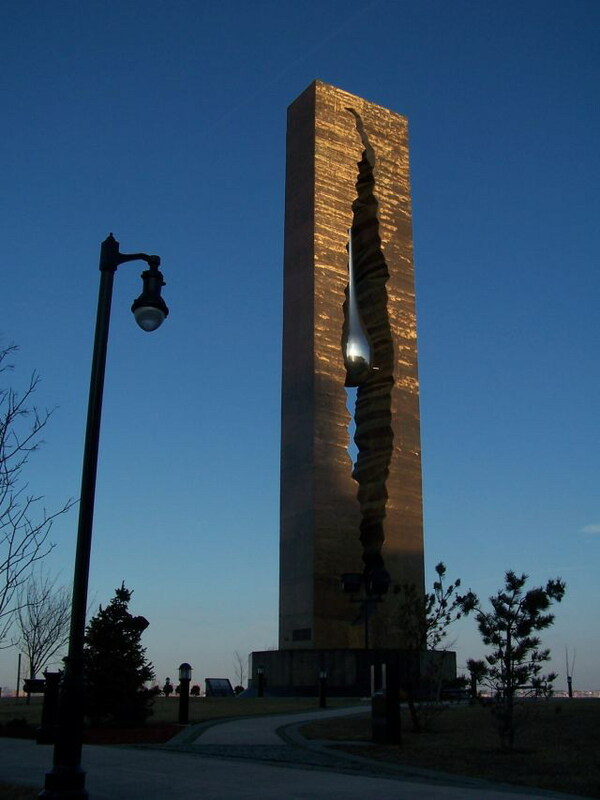 The artwork was designed and fashioned by Russian sculptor ZURAB TSERETELI, and the piece was dedicated on September 11, 2006. More can be read about it at the dedication website, information about how it was built can be found here and in many other places too. “To the Struggle Against World Terrorism” was conceived as the events of 9/11 unfolded and Russian artist Zurab Tsereteli walked the streets of Moscow. Struck by the outpouring of grief he observed, a memorial with an image of a tear formed in his mind. Shortly after the attacks, Tsereteli visited ground zero and looked to New Jersey’s waterfront for an appropriate site for a monument honoring victims of the World Trade Center terrorist attacks. Bayonne was a fitting location; the city was an arrival point for many New York City evacuees on 9/11, a staging area for rescuers, and offered a direct view of the Statue of Liberty and the former World Trade Center towers. Oddly, in recent weeks the rumor has sprouted up that this memorial and it’s dedication were totally ignored by the media. Even Snopes.com felt the need to run a piece on that rumor. It is not true, although to be fair this has not received a huge amount of attention. Funny how the Russians could put an idea together, build it, find a place for it, import it, and erect it, while New York City still dithers about getting almost nothing done about theirs. 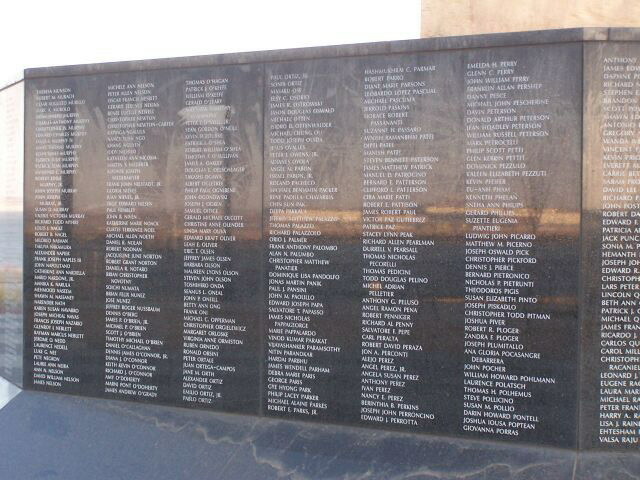 To be frank, more press was given to the “issue” that the Russian sculptor used a slightly out of date list of victims, and thus the names of 40 people who don’t belong there are inscribed on the base. France gave us the Statue of Liberty. Now Russia has given us “To the Struggle Against World Terrorism,” another XXL, in-a-class-of-its-own monument. If you have not seen it, that may be because you haven’t recently approached New York City by ship. For those coming in from the Atlantic, through the Narrows, the Russian gift now heaves into view well before Lady Liberty. That is intentional, according to Zurab Tsereteli, the Moscow-based sculptor who created the monument. “To the Struggle Against World Terrorism” stands at the end of a long, man-made peninsula in Bayonne, New Jersey, and it looks from a distance like a giant tea biscuit. 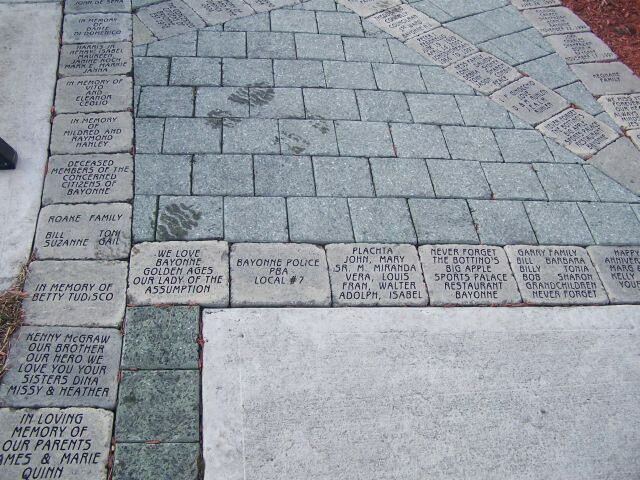 The walkway around the statue contains hundreds of inscribed pavers, some with personal messages from those still here to those who are gone forever.